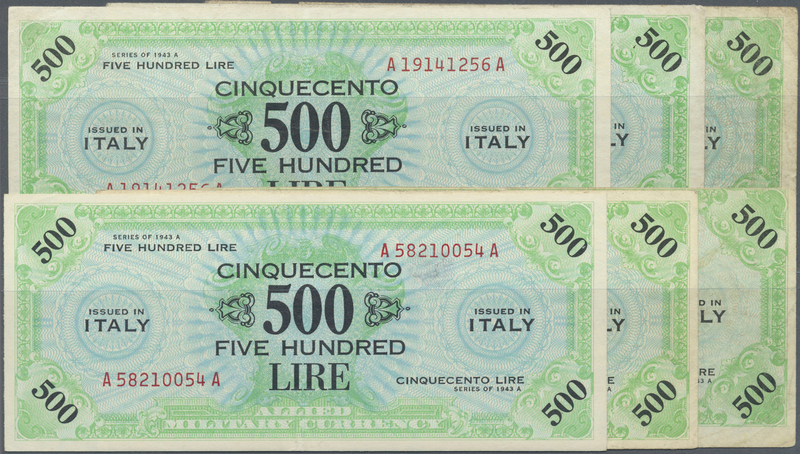 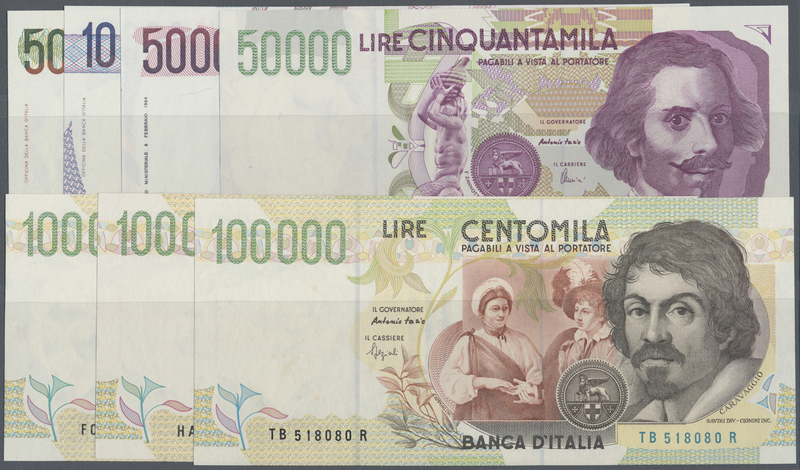 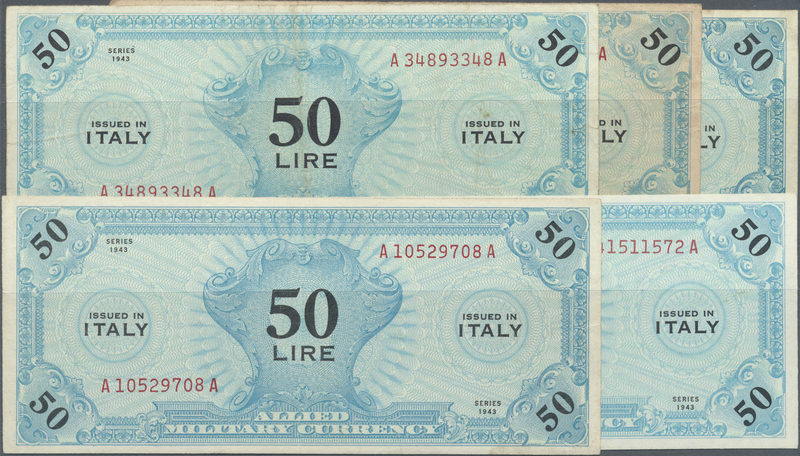 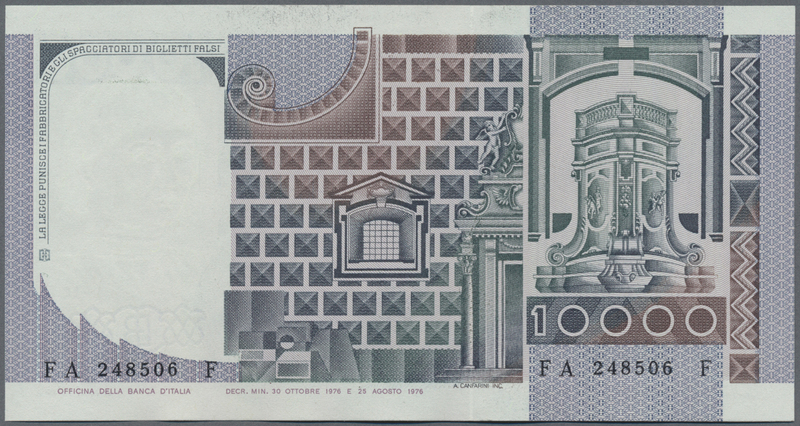 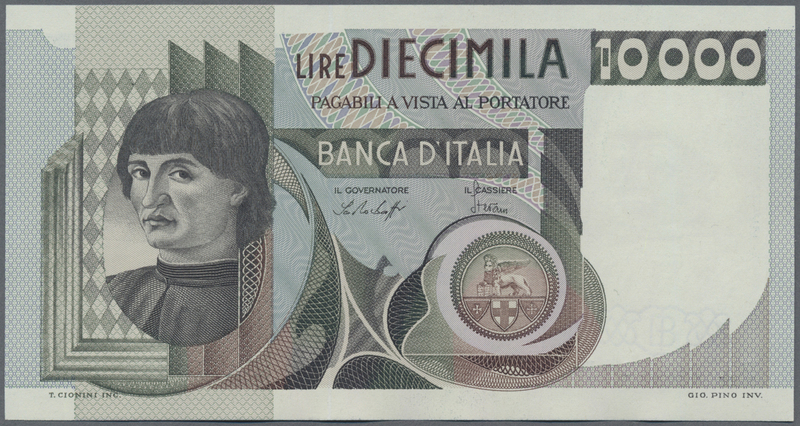 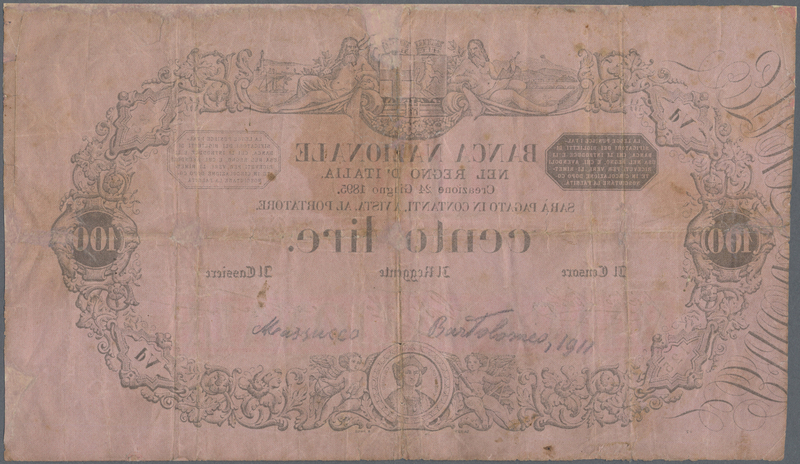 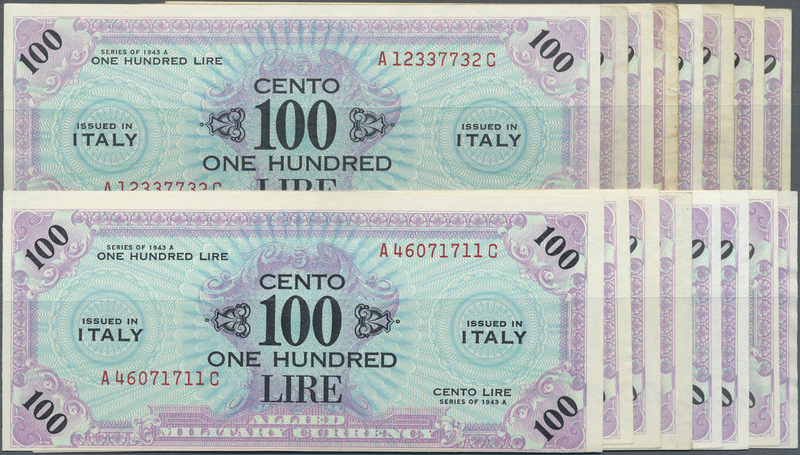 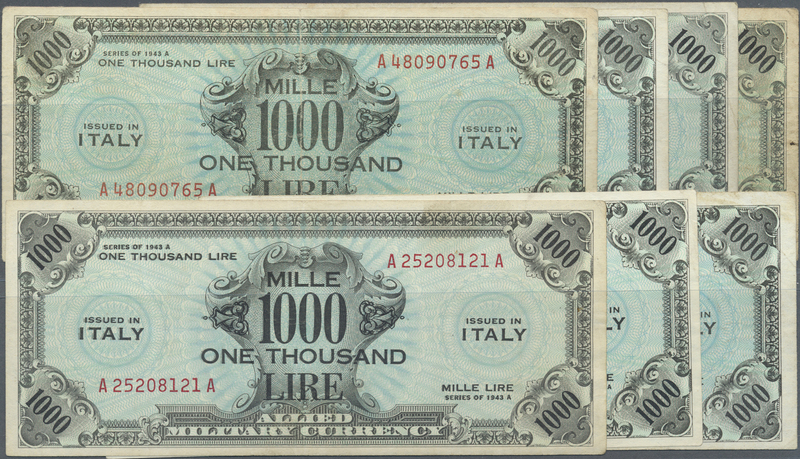 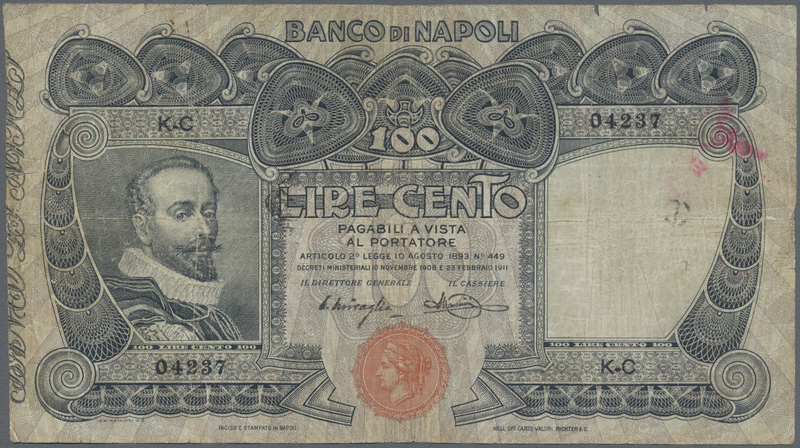 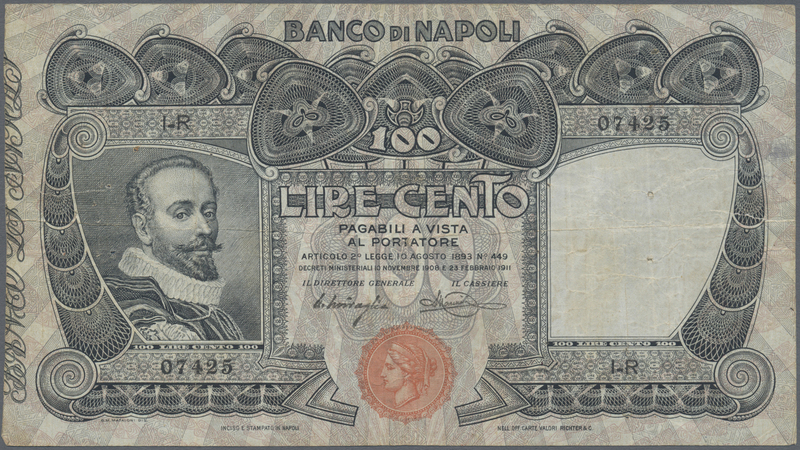 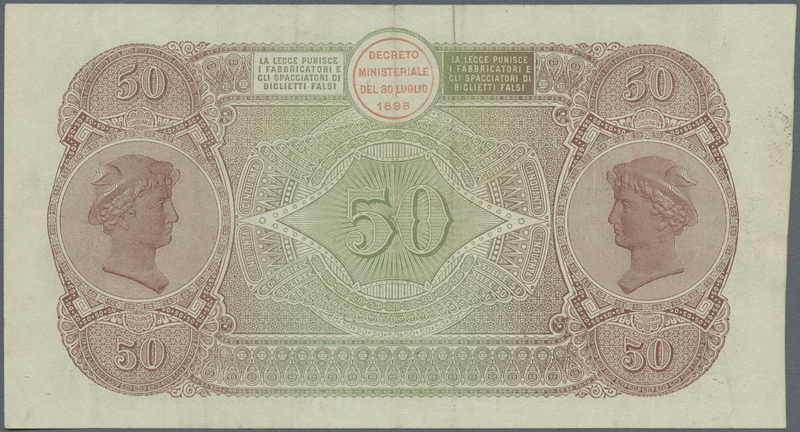 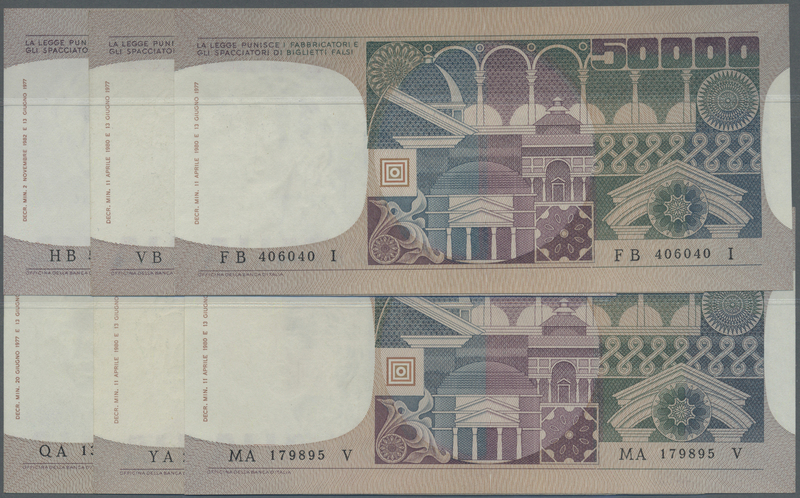 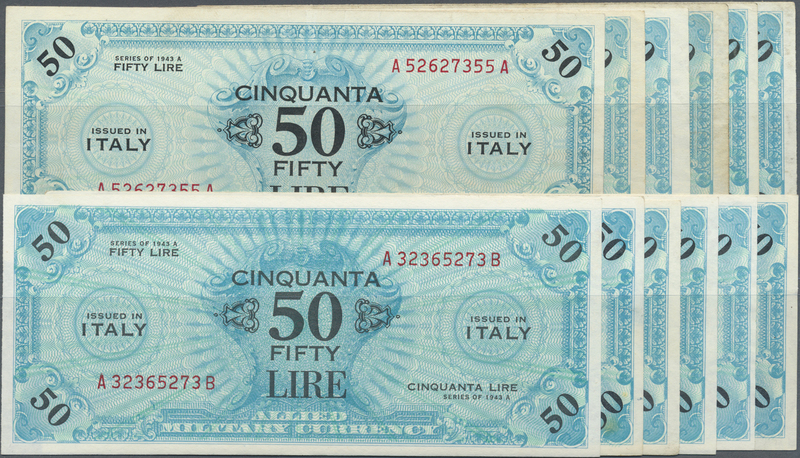 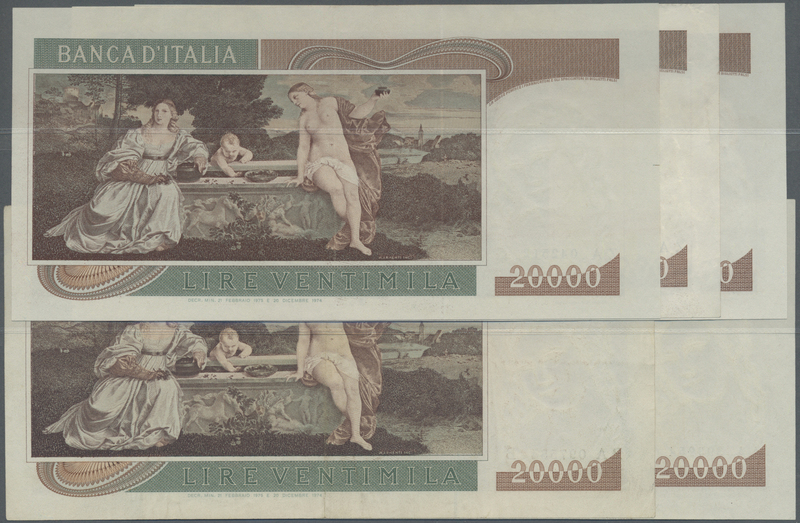 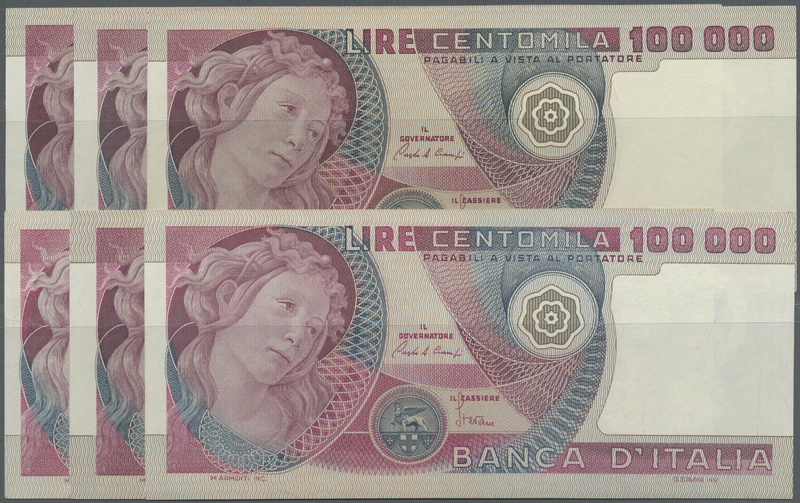 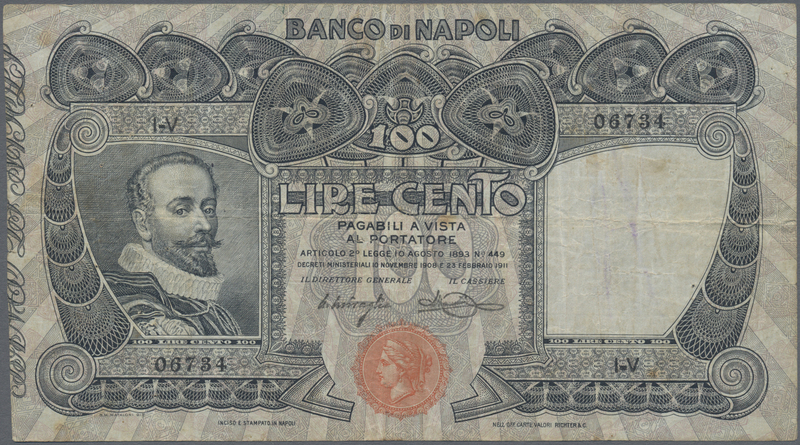 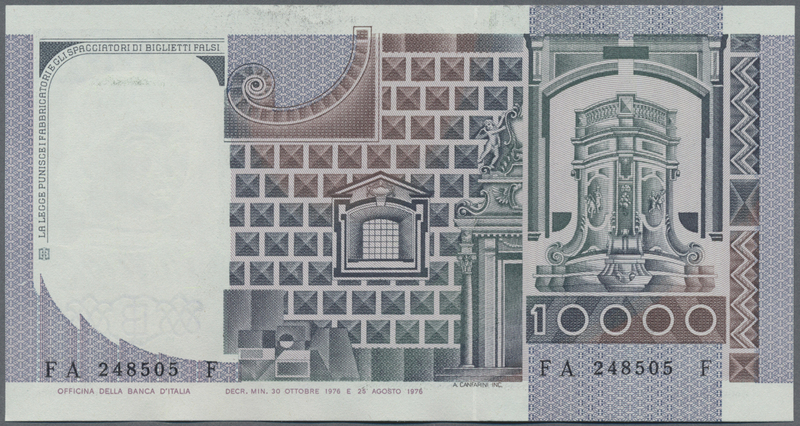 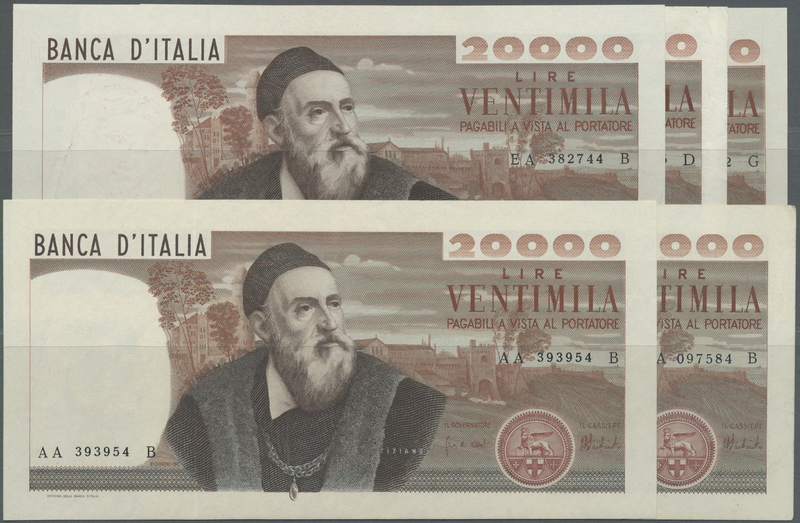 1870 Pick 100b 100.000 Lire 1970 P. 100b Manzoni, S/N V000507N, a bit stronger vertical folds in paper, minor border tears, very strong paper with crispness, original colors, no holes, condition: F to F+. 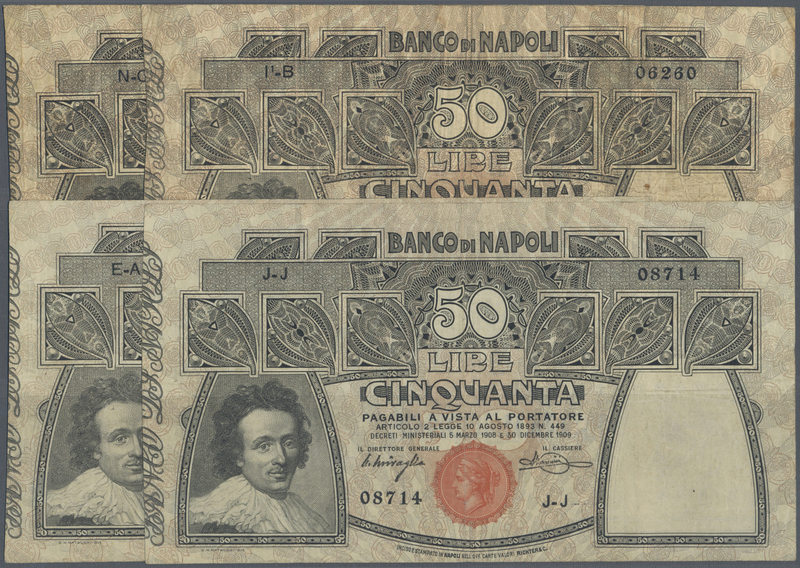 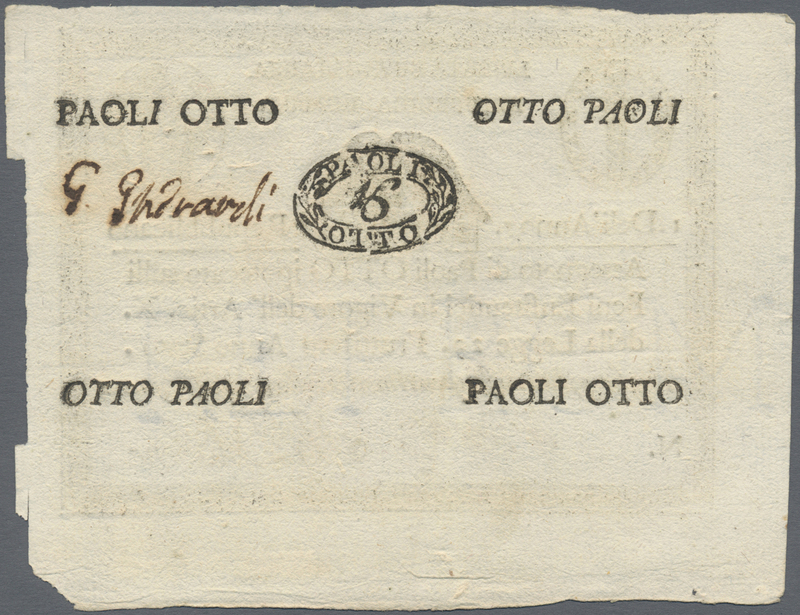 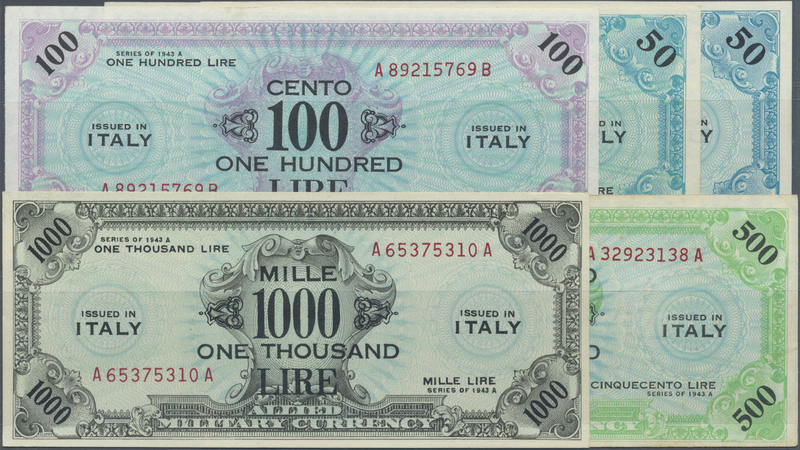 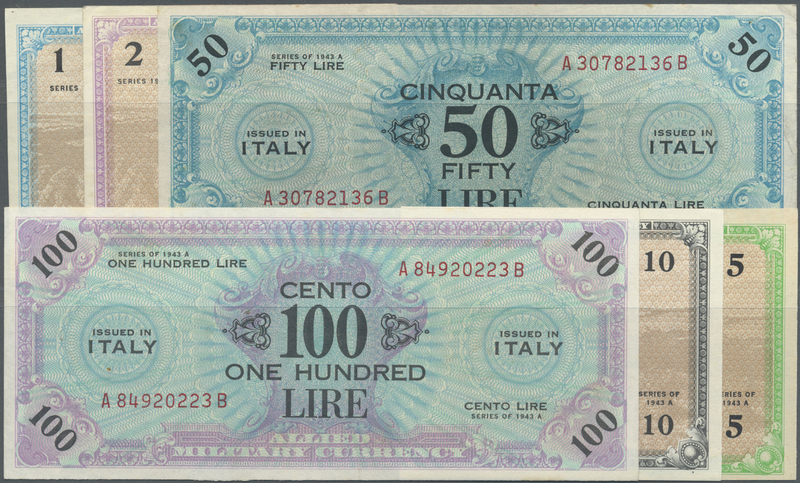 1871 Pick 100c 100.000 Lire 1974 P. 100c Manzoni, S/N B 161128 B, light vertical folds in paper, probably pressed dry but still pretty crisp paper, original colors, no repairs, no holes or tears, not washed, condition: VF to VF+ (optically appears much better). 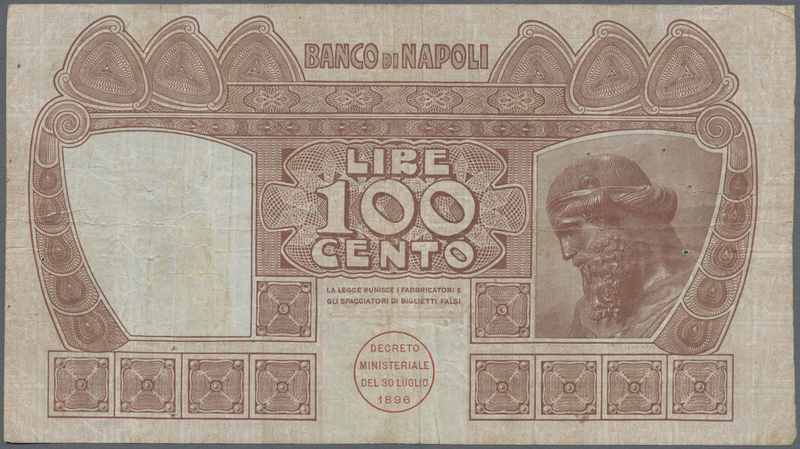 1872 Pick 100c 100.000 Lire 1974 P. 100c Manzoni, S/N D122784F, several folds in paper, pressed, minor border tears, still strongness in paper and nice colors, condition: F+ to VF-, optically appears better. 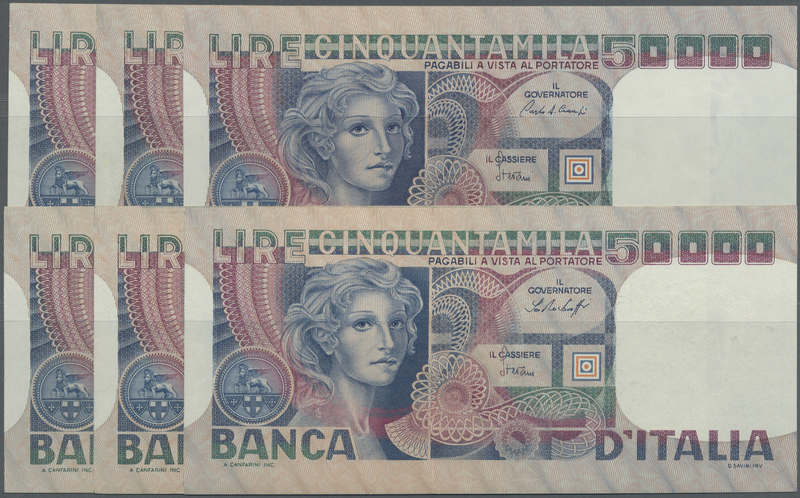 1877 Pick 108b 100.000 Lire 1980 P. 108b, crisp original paper, no holes or tears, original colors, condition: UNC. 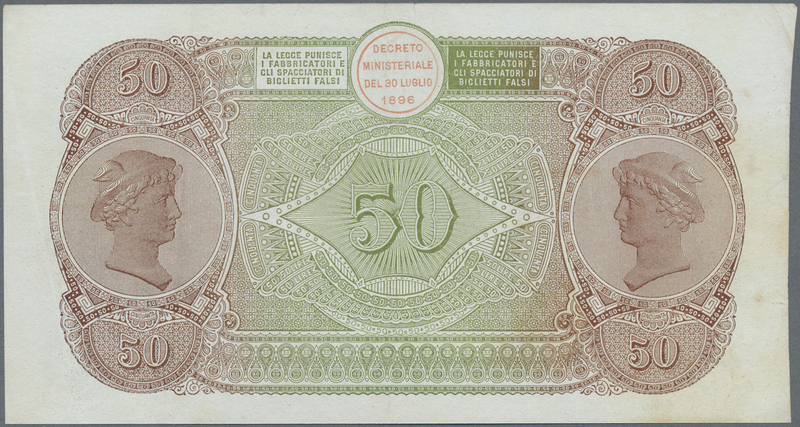 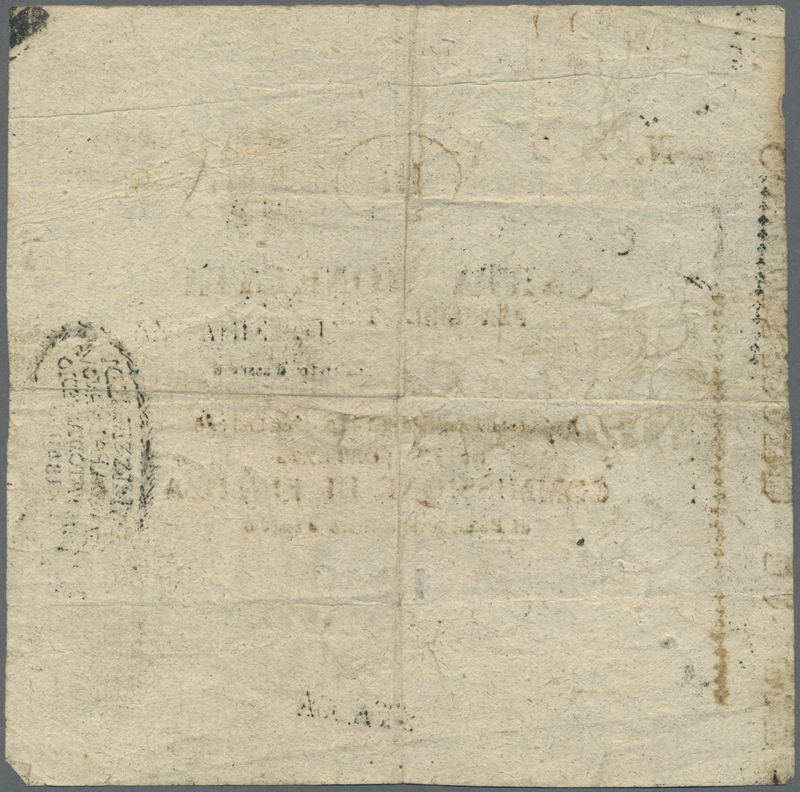 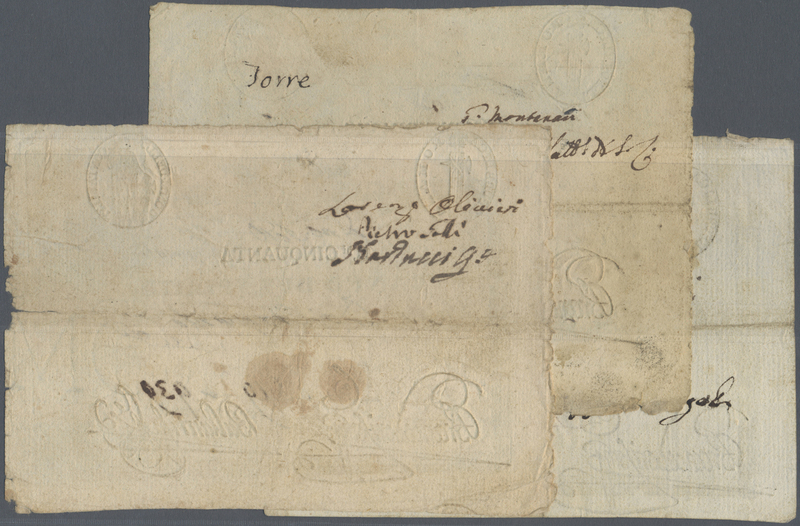 1879 Pick 116 replacement 50.000 Lire 1992 replacement letter "XE" P. 166 in crisp original condition with bright colors and without any holes or tears, condition: UNC. 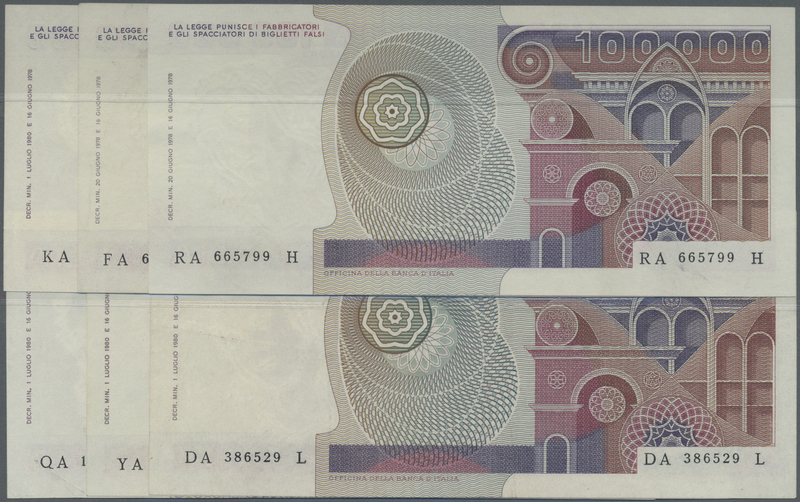 1880 Pick 117 Replacement 100.000 Lire 1994 Replacement prefix XE P. 117, in condition: aUNC. 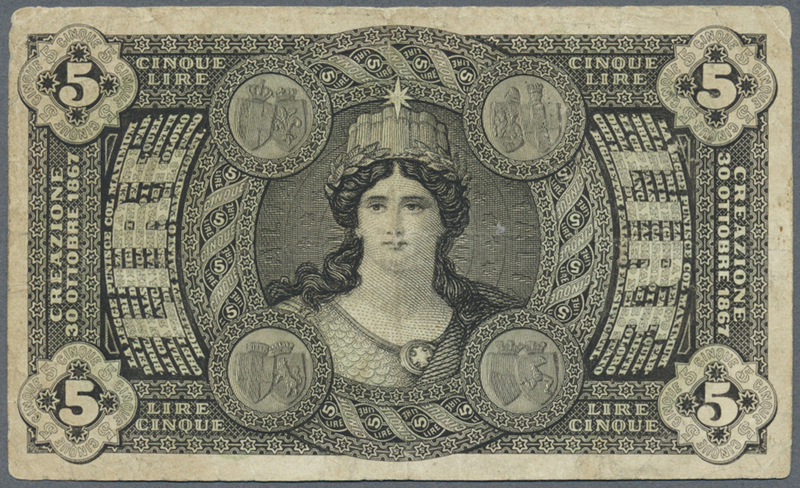 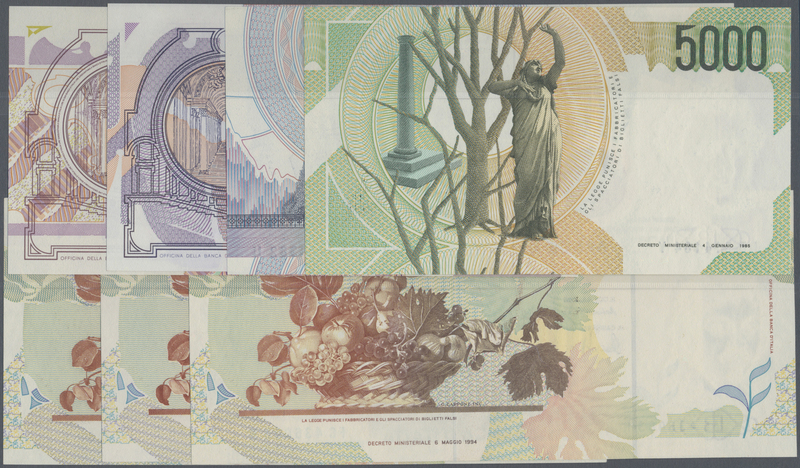 1881 Pick 118 500.000 Lire 1967 P. 118, S/N HA452823, crisp strong paper with original colors, no holes or tears, very light and hard to see center fold, otherwise perfect, condition: XF to XF+. 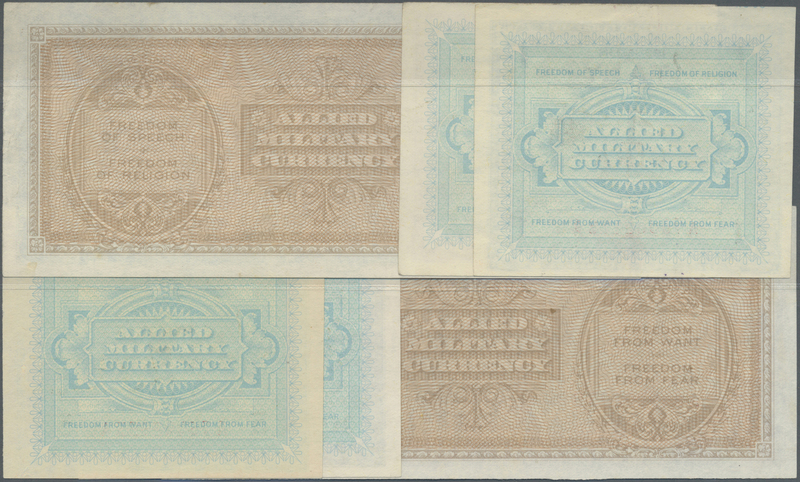 1882 Pick 118 500.000 Lire 1967 P. 118, S/N BA221856F, crisp original, bright original colors, only one minor and very light dint at lower right, condition: aUNC to aUNC+. 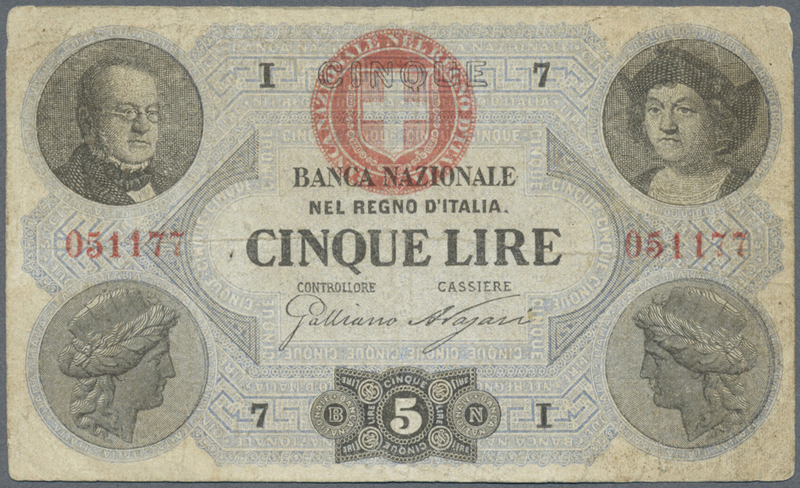 1883 Pick 118 500.000 Lire 1967 P. 118, S/N HA542568C, crisp strong paper with original colors, no holes or tears, very light and hard to see center fold, otherwise perfect, condition: XF to XF+. 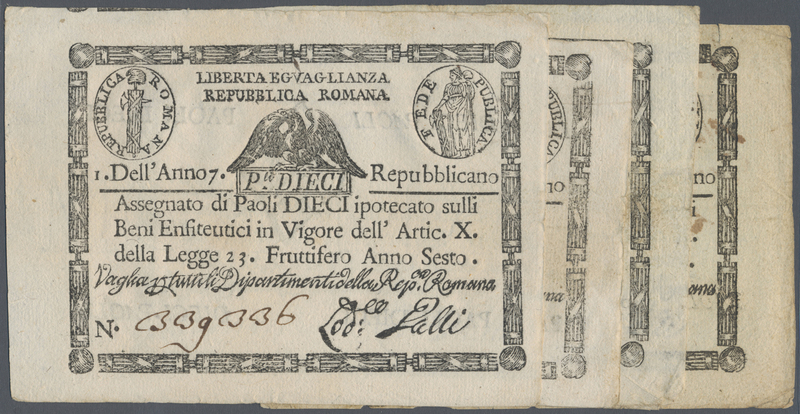 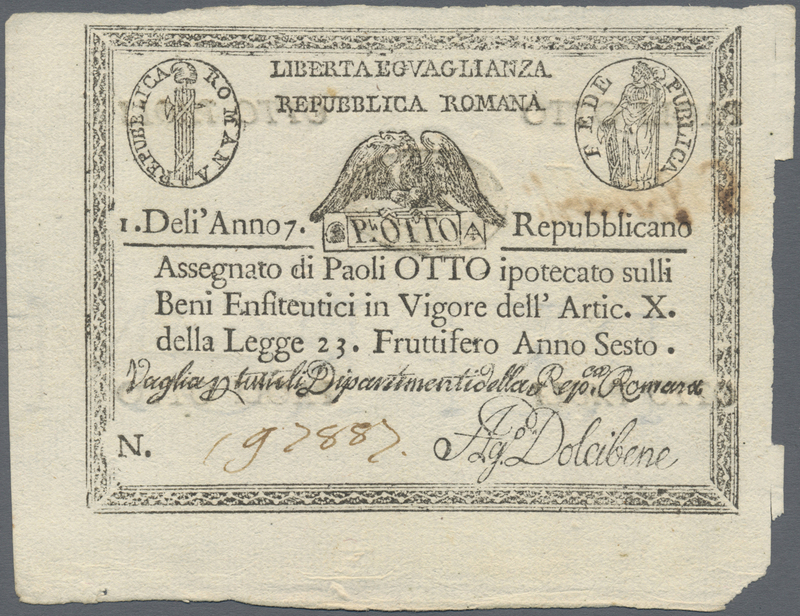 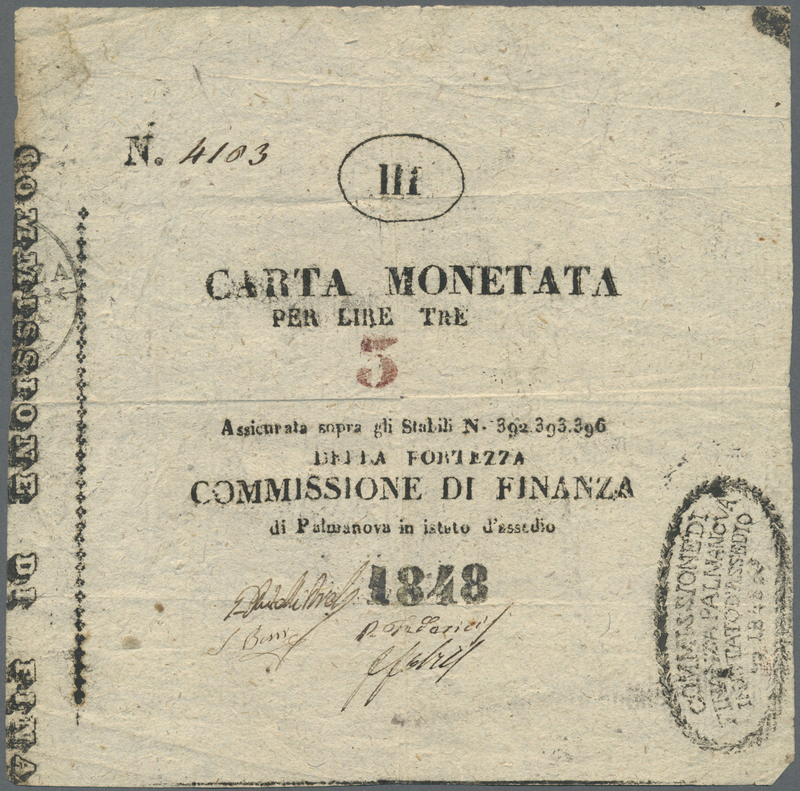 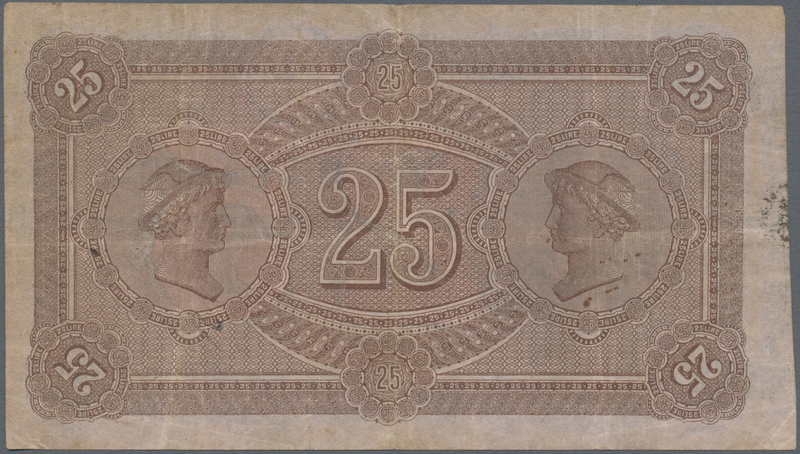 1893 Pick S248 Carta Monetata PALMANOVA 1848 5 Lire P. S248, S/N 4103, used with vertical and horizongal folds, minor center hole, no repairs, still strong paper and nice colors, condition: VF. 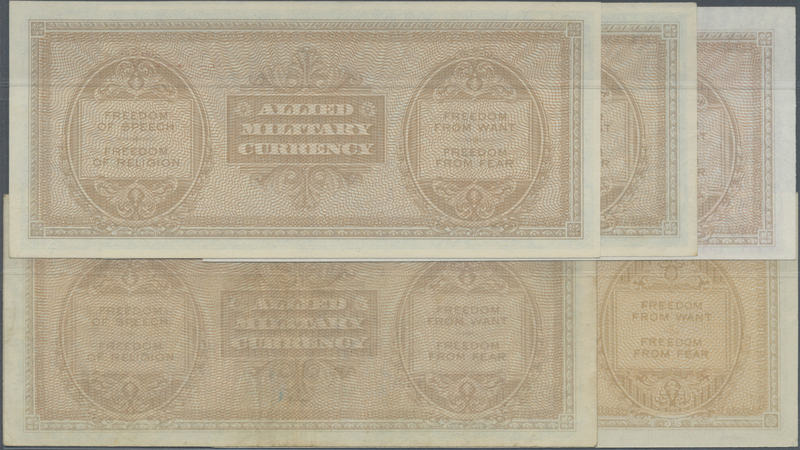 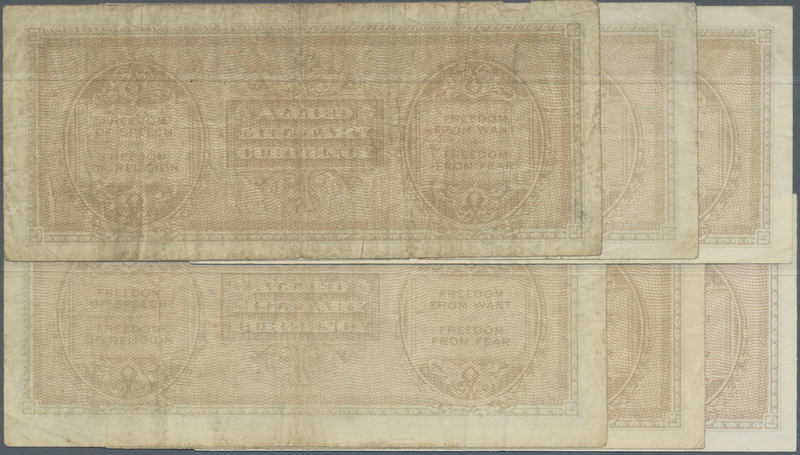 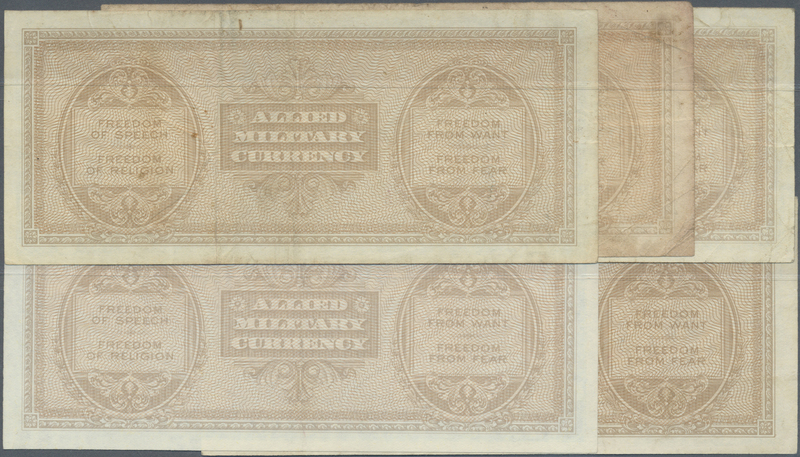 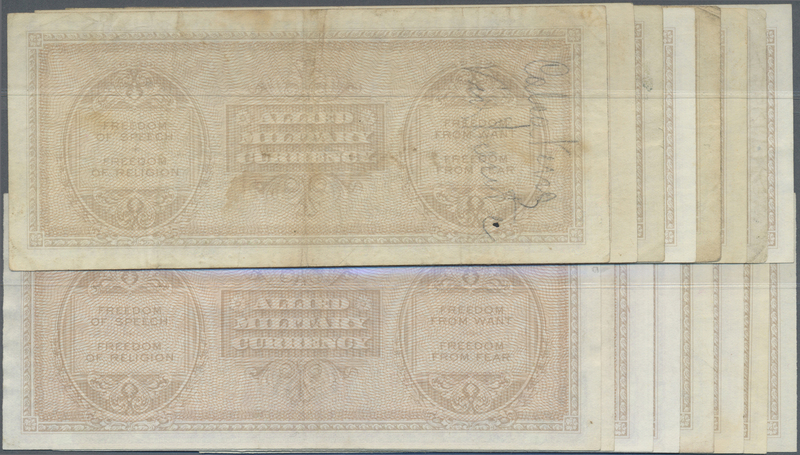 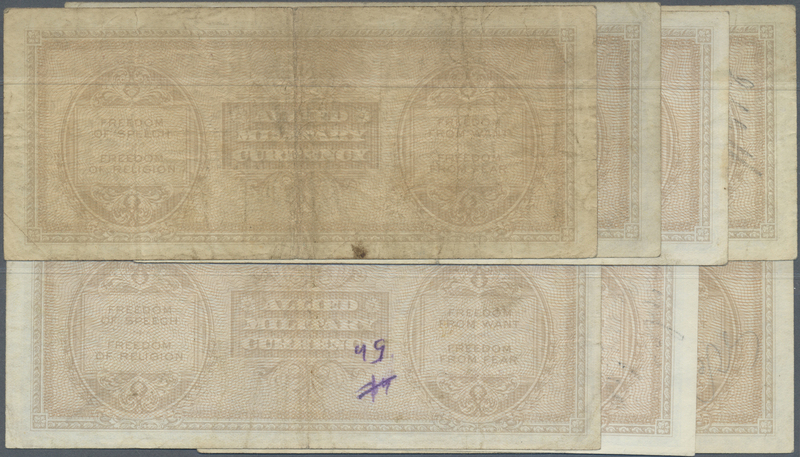 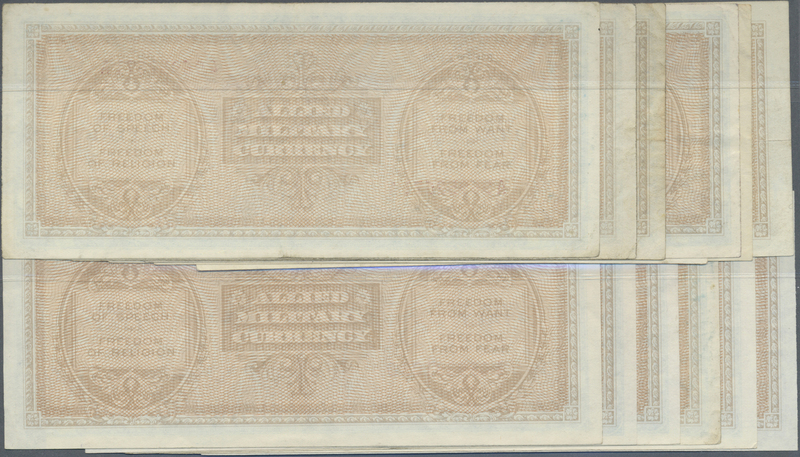 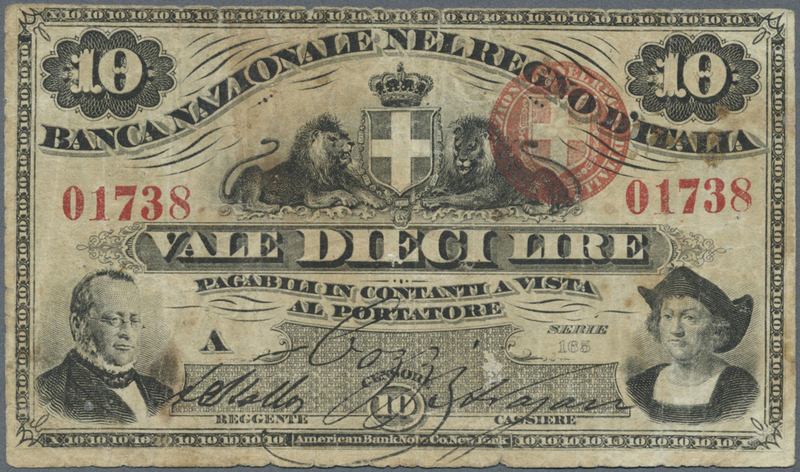 1895 Pick S538 8 Paoli 1798 P. S538, unfolded with strong paper, as always borders worn, no holes or tears, condition: XF. 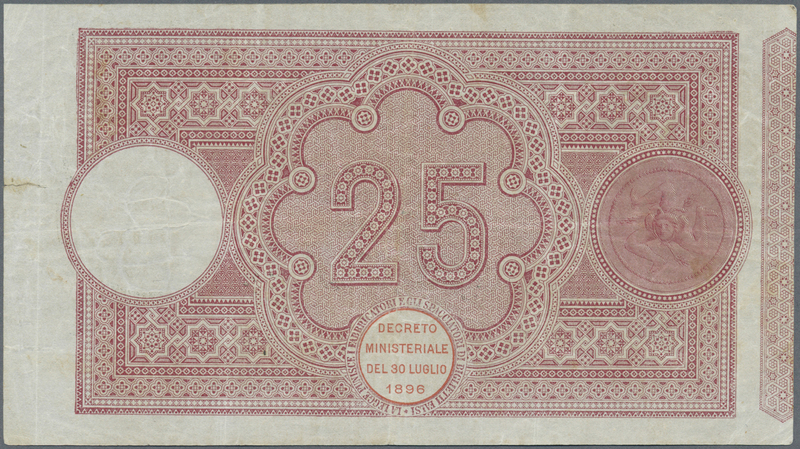 1897 Pick S734 5 Lire 1867 P. S734 with vertical and horizongal folds in paper, light stain, probably pressed, nice colors, condition: F to F+. 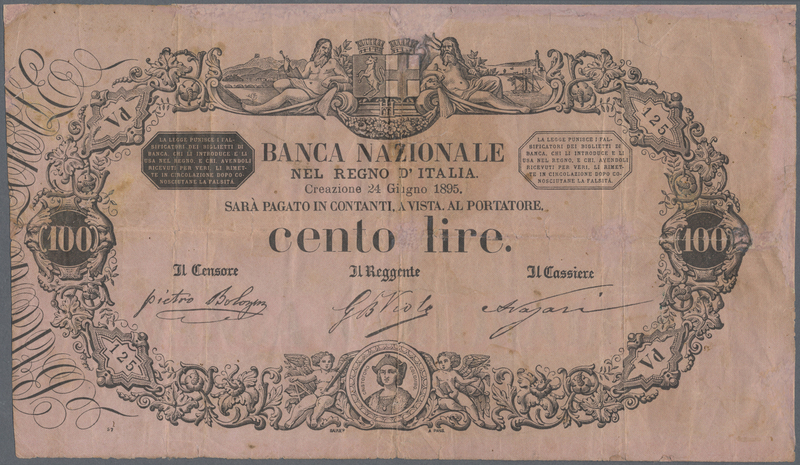 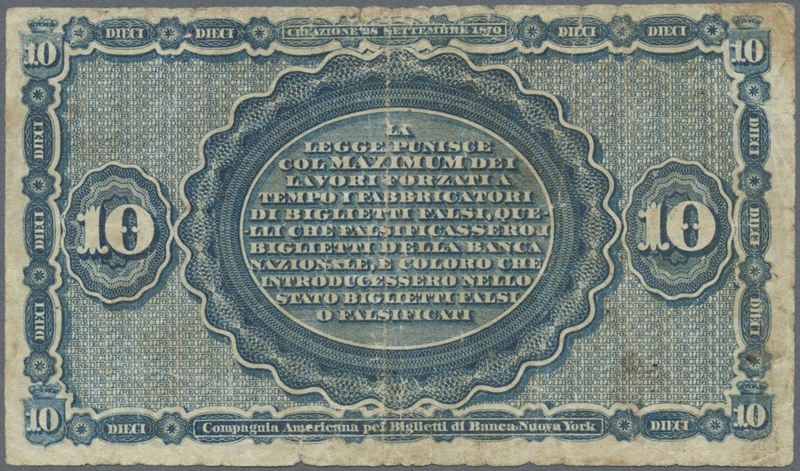 1898 Pick S736 Banca Nazionale Nel Regno D'Italia 10 Lire 1866 P. S736, used with folds and creases, minor border tears, nice colors and no repairs, condition: F- to F.
1900 Pick S843 Banco Di Napoli 25 Lire 1883 P. S843, rare note with vertical and horizontal folds, pressed but still very strong paper and original colors, no repairs, no holes or tears, rarely seen on the market, condition: pressed VF. 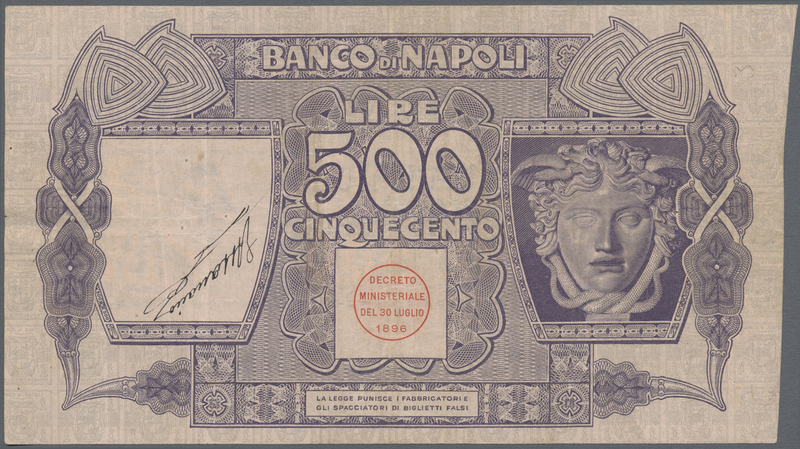 1901 Pick S846 Banco Di Napoli 50 Lire 1893 P. S846, seldom offered note, in exceptional condition with strong crisp paper and original colors, no holes, one minor 2mm border tear at upper border, only light vertical folds, probably lightly pressed but not sure about that, original paper quality, condition: XF+. 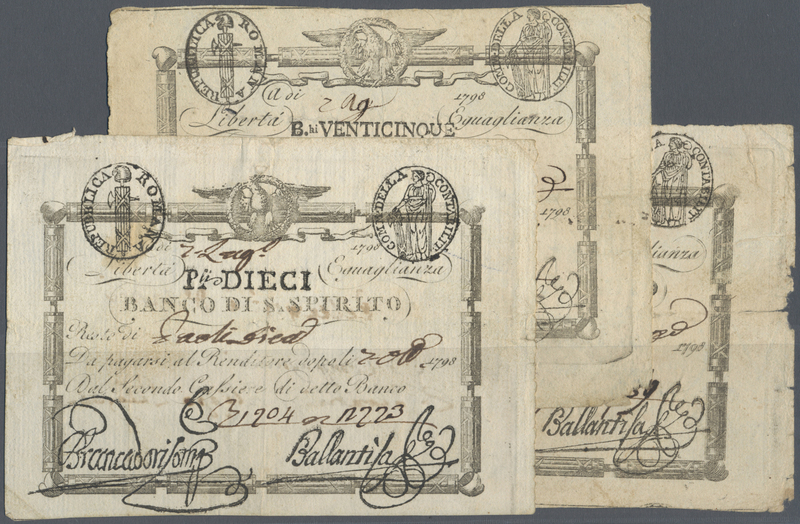 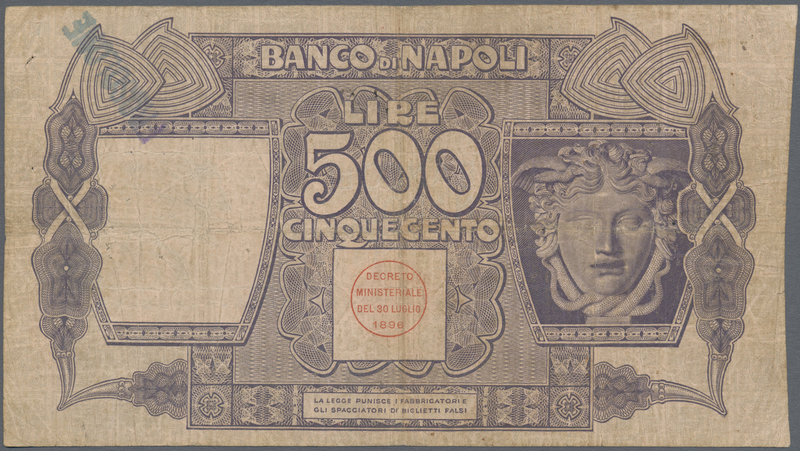 1902 Pick S846 Banco Di Napoli 50 Lire 1903 P. S846, seldom offered note, in exceptional condition with strong crisp paper and original colors, no holes or tears, only light vertical folds, pressed but still strong paper with nice colors, condition: pressed VF+, optically appears XF. 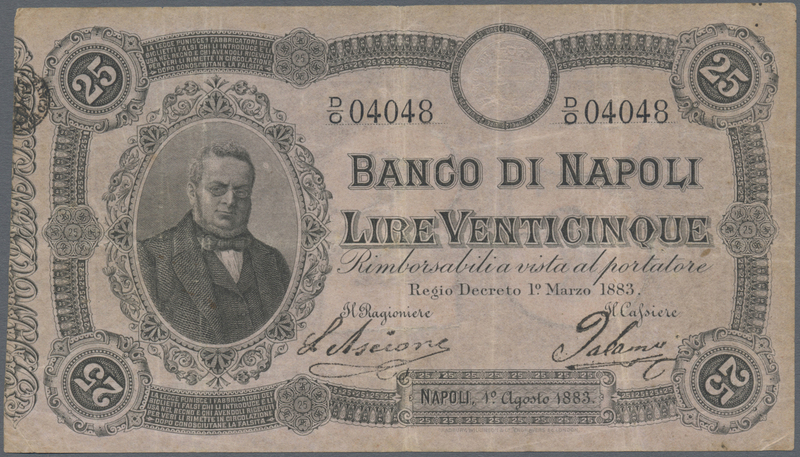 1905 Pick S857 100 Lire 1911 "Banco die Napoli" P. S857 in used condition with several folds and creases, writing in watermark area on back, several pinholes but no tears and no repairs, still strongness in paper and nice colors, condition: F.
1906 Pick S858 500 Lire 1919 "Banco di Napoli" P. S858, used with light folds in paper, probably pressed but still strong paper and original colors, a few pinholes, small writing in watermark area, condition: pressed VF-. 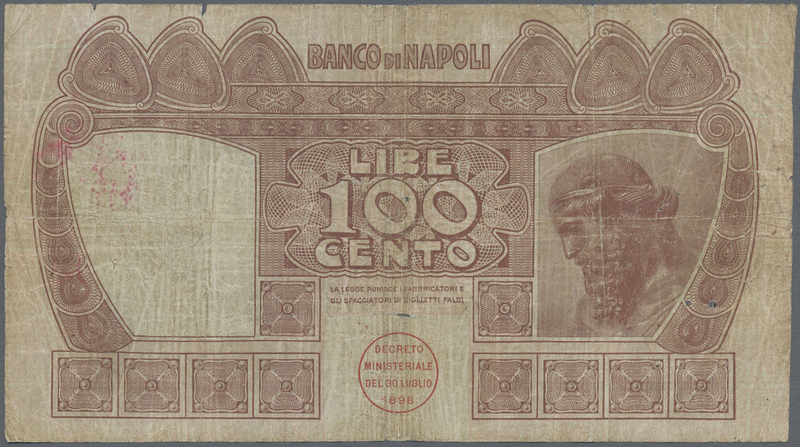 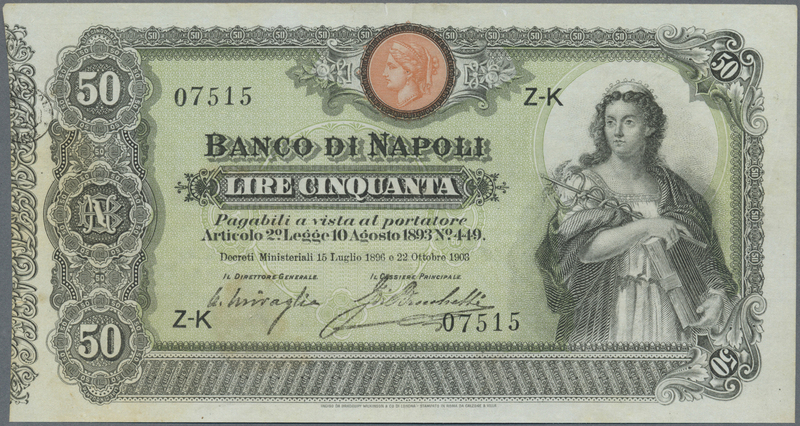 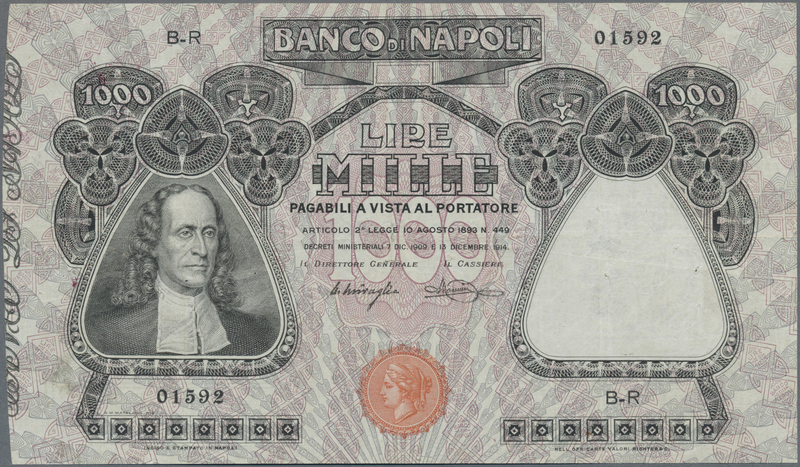 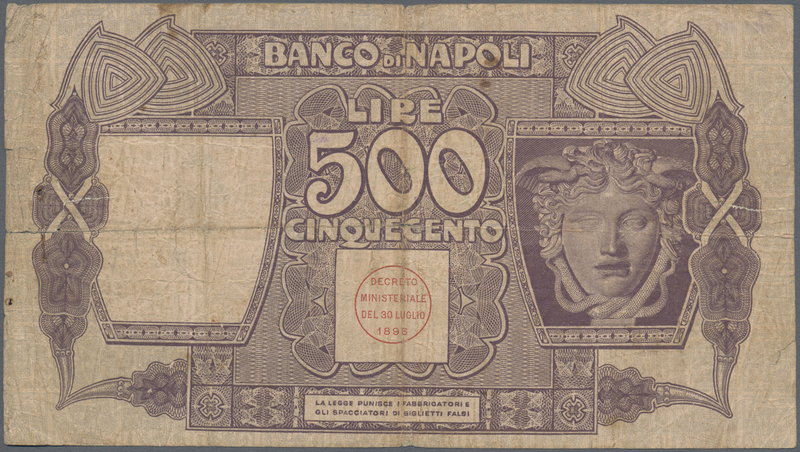 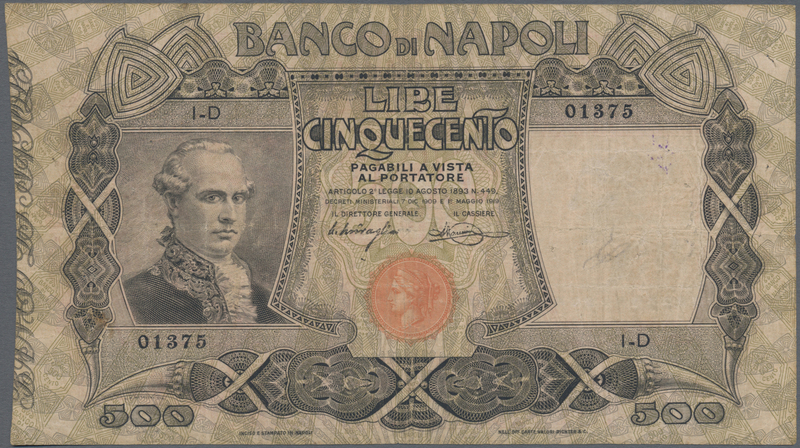 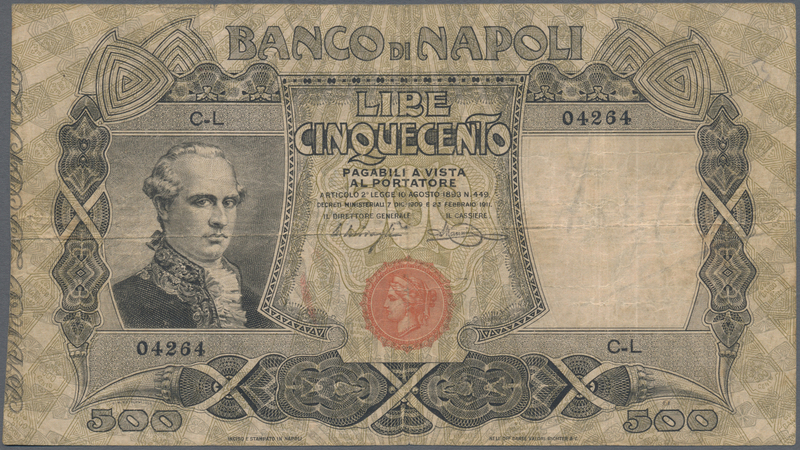 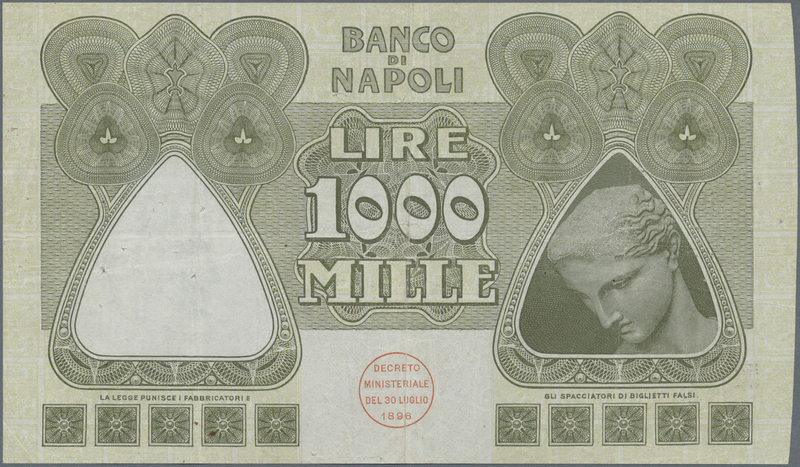 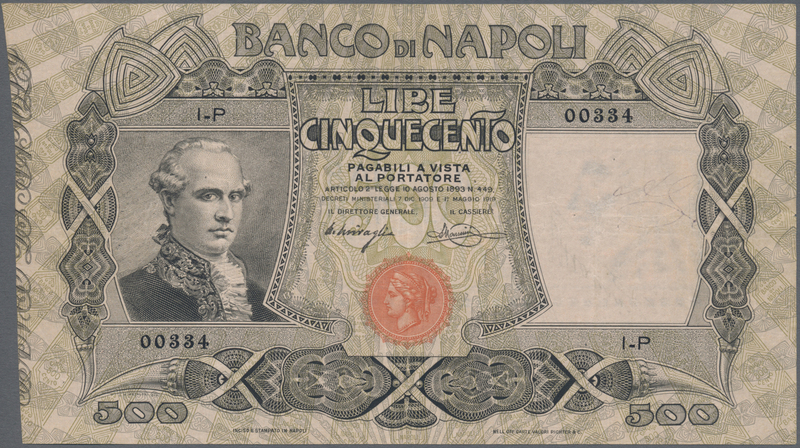 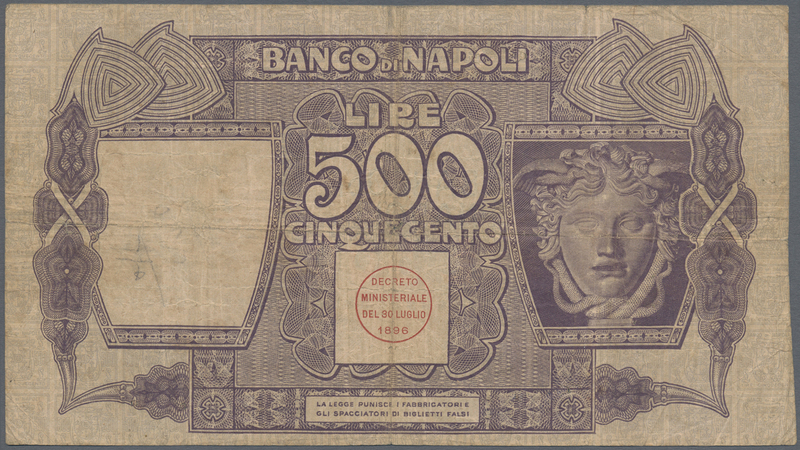 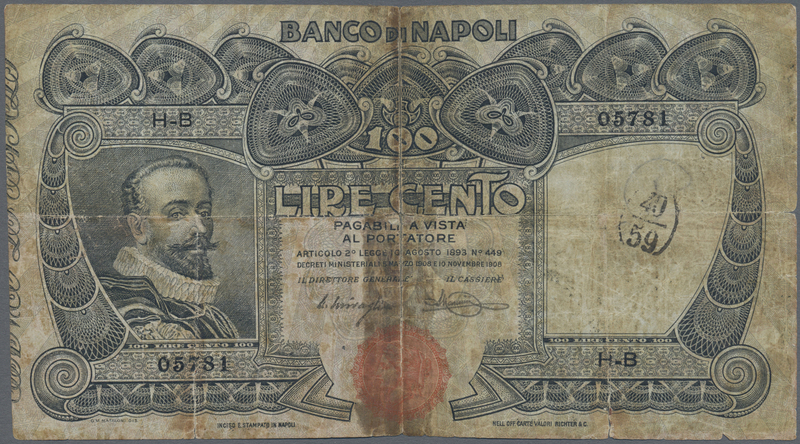 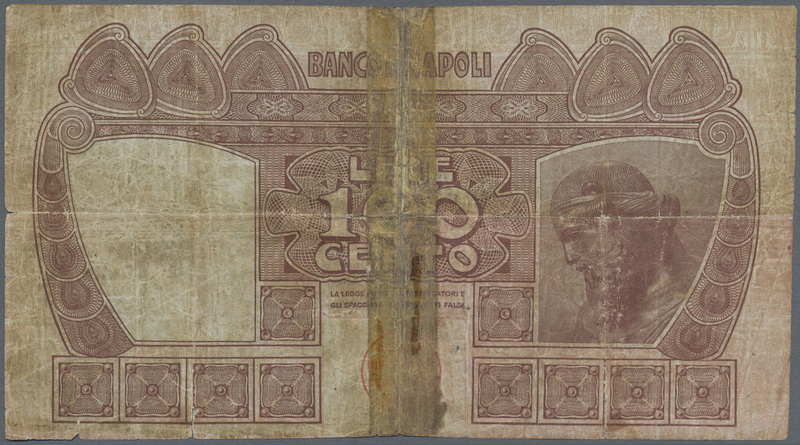 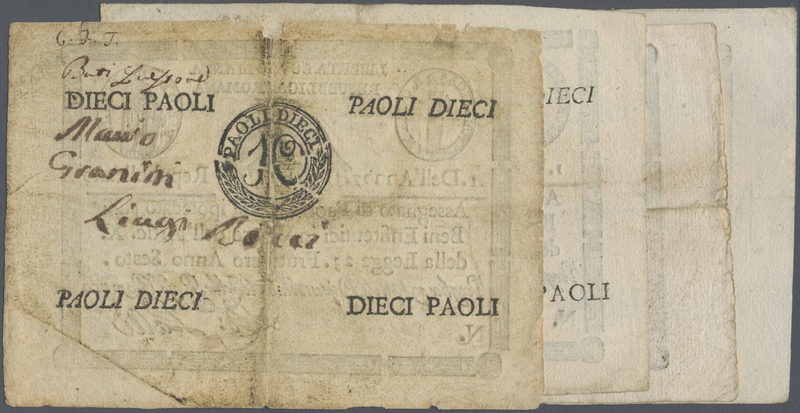 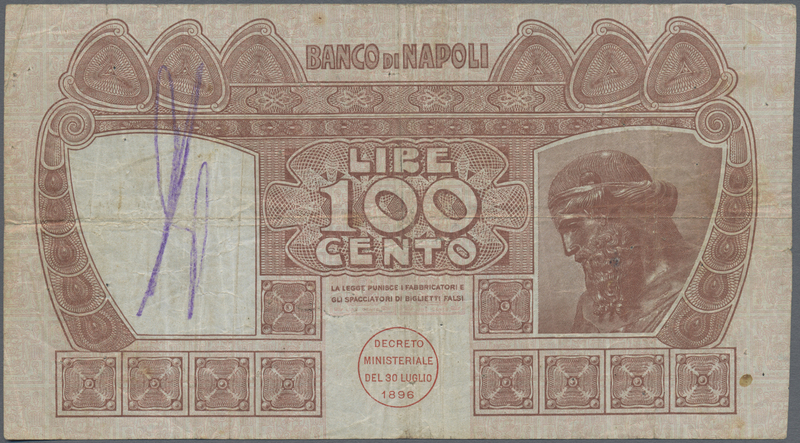 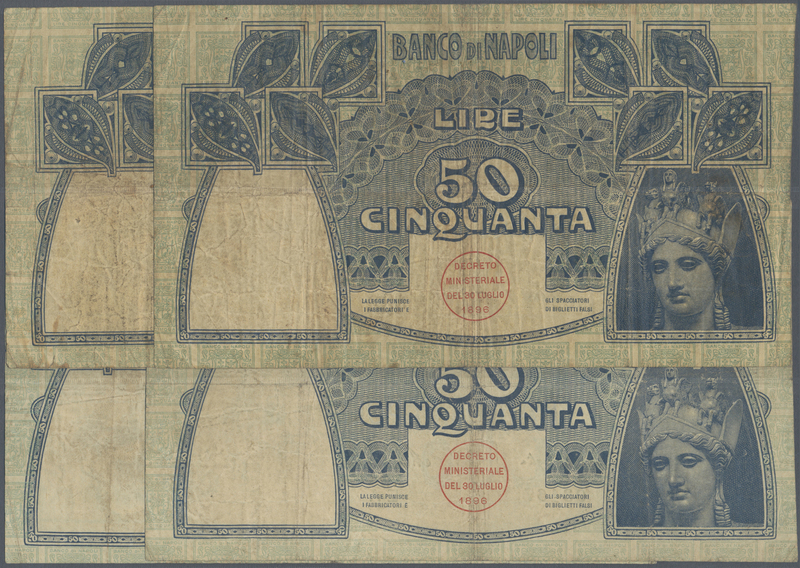 1908 Pick S859 Banco Di Napoli 1000 Lire 1909-1921 P. S859, light folds in paper, pressed but still strong paper, several pinholes at left, no tears, original colors, condition: pressed VF. 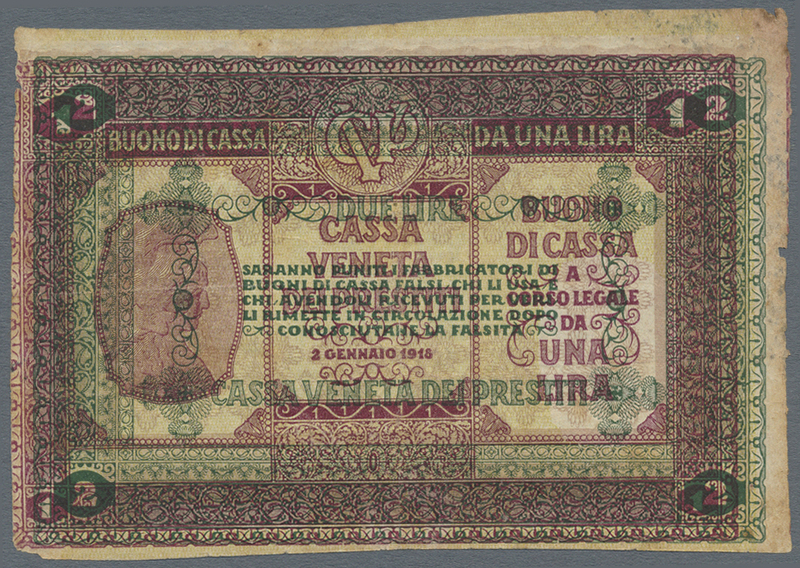 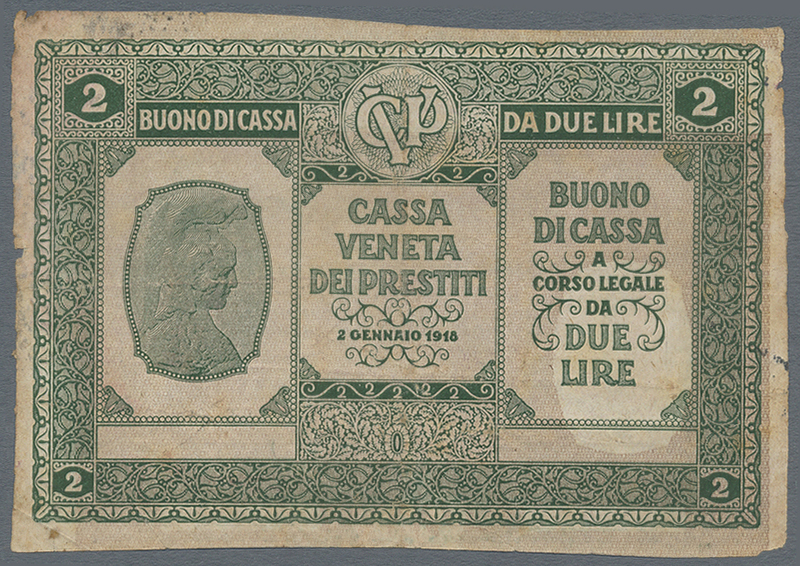 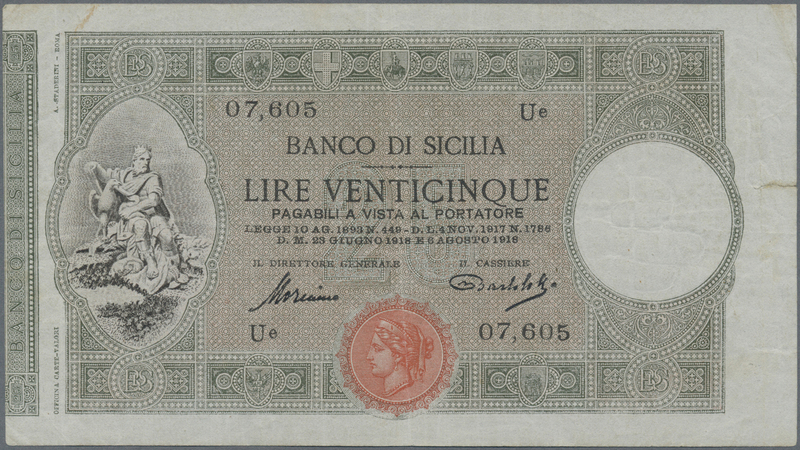 1909 Pick S895 Banco Di Sicilia 25 Lire 1918 P. S895, used with light folds in paper, one 1cm border tear, no holes, strong paper and original colors, condition: VF.